Sometimes a partial denture is required in one arch simply for appearance. More often it is required to improve mastication ability, but if remaining teeth are left unsupported they may drift sideways or over erupt making future replacement considerably more difficult. 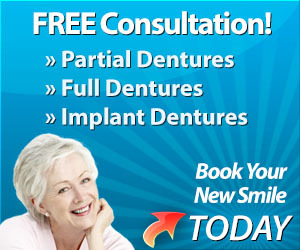 The other major reason to wear a partial denture is to support an opposing full denture. As an example, where you have a full upper denture and only six remaining lower front teeth, a very common scenario is when you bite on the front teeth of the denture, you will tilt the back of the denture down. Also it is impossible to satisfactorily masticate food without full dentition. Conservation of the remaining natural teeth is enhanced and wear and tear of remaining natural teeth is minimised by wearing a partial denture because chewing and grinding forces are more evenly distributed. A partial denture can significantly support the degree of wear of natural teeth. West End Denture Clinic is able to make partial dentures with many different designs and materials. Acrylic partial dentures are the lowest cost and because of the ease of repair, reline or addition of further teeth, are generally advised where remaining dentition is doubtful or tooth loss is significant. Most acrylic dentures will have stainless steel retention, but in some cases that may not be necessary. Another retention option for acrylic dentures is clear or tooth coloured resin retainers. Ask us for more information. Made from an injected thermoplastic nylon. There are two basic types with one being more rigid than the other. They are flexible, translucent, clinically unbreakable and require no metal retainers because the flexibility of the base is used to retain the denture. Another retention option for Nylon Flexible Partial dentures is clear or tooth coloured resin retainers. Repairs, reline or addition of future lost teeth may be possible, but the process often means you will be required to be without your denture for about a week. Ask us for more information if this may be a concern to you. Retention of a cast metal partial can be either cast metal retainer, flexible nylon or tooth coloured resin. Repair, reline or addition of future lost teeth is sometimes possible but may require laser welding, so it is important to check with us.